Boating and green practices go hand in hand. Many boaters enjoy the sport because they like the experience of clean, blue water, and natural settings. Because of this, they are known as a group of people who takes great care in protecting their beloved waterways. Of course, the definition of green boating can vary from person to person, and in practice. It can mean purchasing cleaning and sealing materials that are less harmful to the environment, boating in a way to protect wildlife, or even choosing a boat and/or propulsion method that consumes fewer resources. All of these are great ways to contribute to keeping our waters clean, healthy, and ready for future generations of boaters. Here is a look at some of the categories of green boating, and some ways you can participate. It is well-known that sailors have one of the greenest sources of propulsion there is. Wind-powered travel is easy on resources. The same can be said for any boat, like a canoe or kayak, that is self-propelled. However, what about when the boat is under power? Powerboats come in two different engine styles, two-stroke and four-stroke. Two-stroke engines require a mixture of oil and gasoline, and are known for being louder and creating more exhaust. It is because of this that few manufacturers still sell two-stroke engines. Regulations on both noise and pollutants have made it so most (but not all) engine manufacturers decided it was easier to manufacture four-stroke engines in order to meet new, tighter clean water regulations. Not a lot has been done to use fuel-saving technologies like hybrid and electric engines in boats yet, but as cars become more successful with this technology, it is likely that the same will be adapted for boat engines, with one caveat. Lithium, the main component of many of the hybrid and electric batteries, is highly volatile, and has been known to combust in high-stress situations. Fire can be a danger in any situation, but is even more dire when boating. Diesel continues to be the most efficient of the inboard engines for a boat, and is the choice of most long-distance cruisers because of this. Though biodiesel can be used, it is not readily available yet at marine fueling stations. Hard marine bottom paints: By choosing a hard bottom paint, instead of an ablative paint, you are keeping a large load of heavy metals from dumping into waterways. Ablative paints work by sloughing off into the water, and their high copper and other heavy metal contents can be toxic to wildlife. Though this is great for the bottom of your boat, it is not great for the sea or lake floor. One great choice is Micron CF paint by Interlux. Green soaps: There are a few things that make a soap green. First is a lack of phosphates. These are the chemicals in things like laundry soap that make it super white (and glow under blacklight), but they are a major food for algae, and can contribute to creation of toxic algal blooms. Second, it is made from things that biodegrade easily when the waste water is put into the environment. Though you may see ads for things like dish soap and how it can break down oil slicks, this is not always a good thing. Boaters should never add soap to oil slicks of their own, because it will break the slick into smaller pieces that can be absorbed by aquatic life, and become even more toxic as they combine with the oil molecules. One great choice for a boat cleaning soap is Star Brite biodegradable orange boat cleaner. Green sealants: Another maintenance product type that can carry a lot of harsh chemicals is a sealant. Though most of these are fine when they are dry, they can have some volatile chemicals in them when they are wet. One good choice is to haul the boat out into a dry place when you are waterproofing and sealing the boat’s surfaces. A second choice is to use an eco-friendly sealant like Seal-Once Marine Waterproofer. Where you keep your boat can have surprising impacts, especially in a year-round marine environment. One surprising effect on fish populations is overshading. A region that has too many docks and boat houses will limit light in nearshore areas, and can affect fish populations due to lack of marine plants. Light panels and open grating (instead of boards) will bring filtered light into the water and mitigate for this. Good maintenance in a marina can prevent spills, toxic chemicals, septic waste buildup, and excess electrical current in the water. Some marinas will even help improve water quality in the area by hanging filter feeders like cages of mussels to purify the water around them. Though much of the electrical systems on a boat are run through rechargeable batteries, choosing low-power items still can go a long way in reducing carbon footprint when the time comes to run the engine or generator for a recharge. LED lighting over incandescent, smart electronics that power themselves down when unused, and trickle battery chargers are just a few of the ways to conserve on-board power. Many boats designed for circumnavigation will have additional green energy devices to help lower the power demand on the boat. 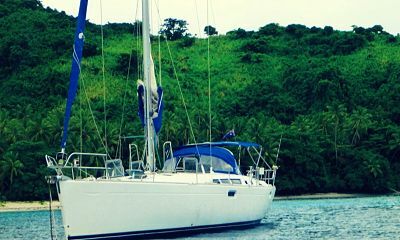 Sailboats and others can be fitted with solar chargers, fresh water makers and hot water heaters. Wind energy turbines can be outfitted on sailboats as well, like those made by Osprey. This can allow for sailors to get by on long trips with as little fuel use as possible. The reclaimed materials movement is going from homes to boats. Refitting new boats from old hulls is one great way to do this. Another is to choose an aluminum boat that has been sourced from recycled and reclaimed sources. If reclaiming a boat on your own seems like too much work, more and more boat builders are working with sustainable sources to create earth-conscious products. This may mean using recycled metals or sourcing wood from certified green timber companies. One company that prides themselves on their sustainable product sourcing and building practices is Hurricane Boats. Even the way you boat can help to protect marine resources, particularly when it comes to larger wildlife. Staying clear of marine sanctuary areas can protect young threatened and endangered animals like seals, sea lions, manatees, and seabirds. Boating slowly near shorelines can help prevent erosion of banks that can muddy waters and clog gills of fish species. Being careful in areas where animals who are not boat-conscious, like manatees, can keep them safe from propeller damage. Careful boat discharge, like avoiding the dumping of plastics, can prevent damage to fish and other species who like to bite at anything bright and flashy. If you are not sure how best to protect the wildlife near your waterways, talk to the local marinas. There are usually regional rules that work for specific species that only exist in certain areas. Agencies will usually mark areas well that need extra protection. There are many different ways to be a green boater, depending on your priorities, budget, and level of opportunity. One of the best parts of making these choices is that they often come with additional rewards for boaters. This can mean more fuel saved, which often turns into more money in your wallet at the end of a boating day. It comes with the confidence that you are protecting a resource that brings joy to you and your family, and works toward allowing a chance for you or perhaps your kids to share these same joys with their grandchildren. Keeping a healthy, clean waterway contributes to a better world for us all.